The Thomasville CrossWalk grew out of the Thomasville Ministerial Association many years ago. As a very literal response to Christ’s call upon our lives in Matthew 16:24 to “take up our cross and follow [Jesus]“, the Thomasville CrossWalk is an event in which an actual 8-foot tall wooden-beam cross is carried across the downtown area of Thomasville. Some of those who come to participate in this event take turns dragging the cross along the road. In addition, at predetermined points along the route, the crowd stops and pastors of local churches read Bible passages describing the journey that Christ took along the Via Dolorosa on the day that he was crucified. It is an opportunity for churches to come together and celebrate in a very personal way the Passion of Christ. 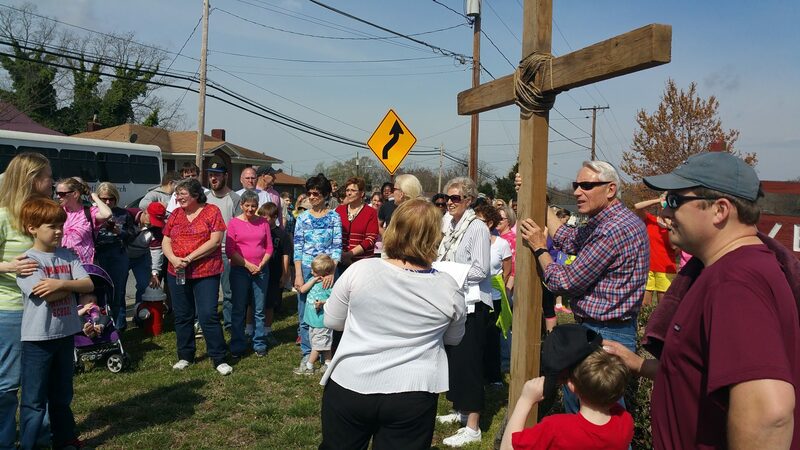 Although the Ministerial Association is no longer functioning, the legacy of the Thomasville CrossWalk has proven to be quite meaningful for many people and has continued as a witness of the power and grace of the Easter season. The CrossWalk is open to everyone and our hope that this becomes an opportunity for the Thomasville community to be united for the sake of Christ. Thank you and I hope to see you on Good Friday! For more information please contact Rev. Rodney Denton (336) 472-7718.